Although the sessions, education and designation ceremony are all important components to the Claims Education Conference, we like to offer plenty of opportunities for social gatherings and networking where the casual exchange of ideas can be very valuable to the learning process. We hope you will consider joining us for some of the activity options that follow. The recognition and awards chef and restaurateur Emeril Lagasse has garnered have made him known to food-loving Americans everywhere. His restaurants consistently win critical praise and top ratings. We have reserved a limited number of tables for our group to dine at Emeril’s with three different seating times available: 6:00, 6:30 and 7:00. We will be able to order directly off the menu and enjoy signature dishes such as New Orleans Barbecued Shrimp, Andouille Crusted Redfish and Banana Cream Pie. Click here to view the menu – this is an event your tastebuds will not want to miss! Experience true New Orleans flavor and join us for this very exclusive dining experience. No fee to sign up. Meals, drinks and gratuity will be paid for by each participant. Cook & eat an authentic Louisiana meal! In this highly interactive class, groups actually cut, season and saute a complete dinner with one of the expert chefs, and afterwards you will be able to sit down and enjoy the meal you have just created.This class is not limited to foodies - all skill levels are welcome to join in on the fun! $160 per person. Join us for a high speed Airboat Ride and Louisiana swamp tour. You’ll be touring 20,000 acres of tidewater cypress swamp. It’s a dynamic ecosystem supporting many types of aquatic and moist-soil vegetation, as well as a diverse wildlife population. You will be immersed in some of the most beautiful scenery in the world as you go through the swamp and into the bayous lined with moss-draped cypress and tupelo-gum trees. During your nearly two-hour tour you’ll have opportunities to see alligators, snakes, turtles, egrets, herons and ibis, and sometimes hawks, owls and bald eagles. $80 per person. This tour gives you the opportunity to see firsthand what it takes to bring Mardi Gras to life year after year. Walk through the hard work and extensive planning that goes into this grand event when you tour Blaine Kern Studios, an operating workshop that has created breathtaking floats for Mardi Gras and other parades around the world since 1947. On the tour, you’ll be paired up with a knowledgeable guide who takes the mask off of Mardi Gras. This all-access opportunity winds you through the massive studio, where artists and architects build Mardi Gras floats from the ground up. You’ll learn about the history of this unique and festive tradition, going beyond its reputation to get a deeper understanding of the REAL Mardi Gras. This New Orleans tour is an experience you’ll want to document. There are so many photo opportunities in front of floats, with props, or wearing a traditional Mardi Gras costume, so don’t forget to bring your camera! And bring your appetite, too: every tour comes with a slice of King Cake (which is a real delicacy, as it’s hard to find out of season!). $25 per person. The Garden District was originally developed between 1832 and 1900 and is considered one of the best-preserved collections of historic mansions in the Southern United States. Originally the area was developed with only a couple of houses per block, each surrounded by a large garden, giving the district its name. wandering down the brick lined sidewalks. Originally settled by the Americans who migrated here to make fortunes after the Louisiana Purchase of 1803, it is now the neighborhood of Sandra Bullock, John Goodman and the Manning football family. This leisurely, guided stroll also includes a stop at the historic Lafayette Cemetery #1 which is the most filmed cemetery in New Orleans. Most recently scenes from The Originals on the CW Network and NCIS: New Orleans have been filmed here. $40 per person. The National WWII Museum tells the story of the American experience in the war that changed the world. Through exhibits, multimedia experiences, and thousands of personal accounts, the Museum takes visitors on an immersive tour of World War II in every theater of war. campaign to defeat the Axis powers and preserve freedom. Our tour guide will also highlight several artifacts, displays, and exhibits during the tour. Our group will also attend a showing of Beyond All Boundaries in the Solomon Victory Theater. $50 per person. Step back into the glamour and romance of the riverboat era with a jazzy dinner cruise. Experience the lively sounds of the amazing Sullivan Dabney, Jr. and the Muzik Jazz Band while enjoying a lavish Creole Buffet in the elegantly appointed dining rooms. After dinner, and maybe a little dancing, enjoy a classic New Orleans cocktail and sweet Mississippi River breezes on the promenade deck as the city skyline slips by under a canopy of stars. This dinner cruise is pure New Orleans! $79 per person, includes dinner, cash bar available. Participate in a live séance! Join us in an séance at a local historic location where the lines between life and death are blurred. Who knows what spirits you will connect with! $80 per person. Enjoy a narrated journey with a professional historian. Hear of a land of Creoles, pirates, and voodoo. View Evergreen, Whitney, Felicite' Columbia and St Joseph as you travel the Old River Road to visit Laura, a Creole plantation whose charm is as rich as her history. 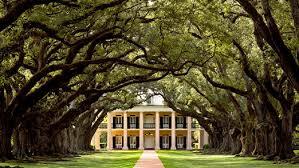 Afterward, tour the treasure of the Old South, the magnificent antebellum Oak Alley mansion. With 28 three century old oak trees lining its entrance, Oak Alley is an exquisite reminder of an bygone era, an era now "Gone With The Wind." The cost is $110 per person. Note that lunch is not provided; however, there is a snack and gift shop at Oak Alley where you can purchase refreshments. Many other activity suggestions can be found on the Hotel Information Page.